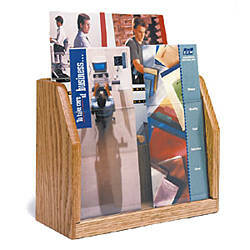 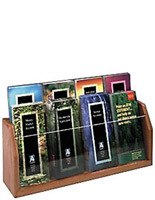 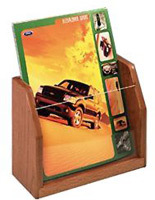 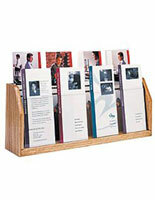 This acrylic and oak brochure holder, also known as a leaflet display for business, is a desktop stands system for dispensing company publications. 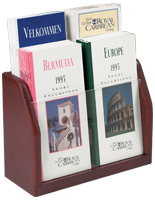 Each of these clear accessories makes your promotional materials easy for customers to see, and take away! 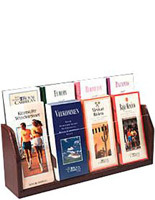 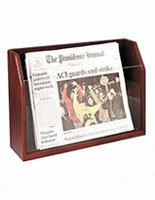 This brochure holder that is a countertop mount for collateral materials offers four slots in which to display periodicals. 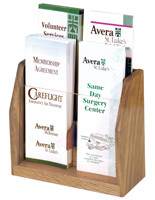 The plastic pocket inserts for tri-folding literature organize brochures and collateral material in a professional manner on a desk or table surface.